Jessica found yoga early on as a physical benefit to her figure skating career, but soon discovered the endless array of benefits beyond the physical aspect. 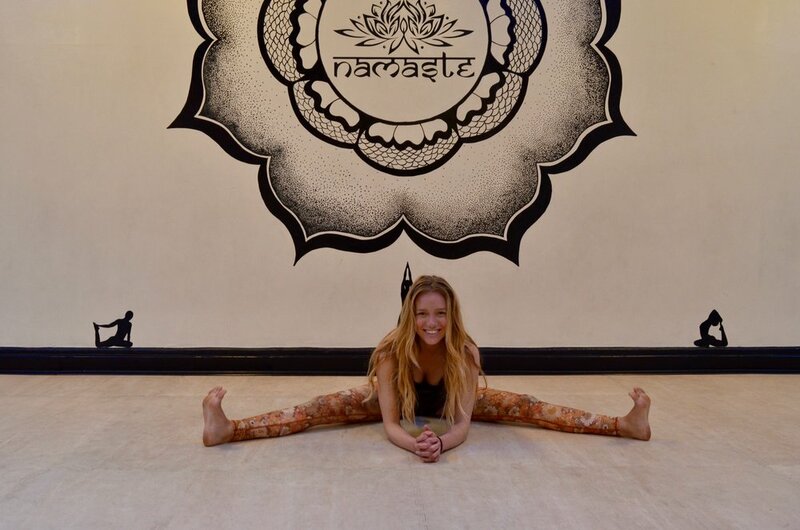 Jess began teaching yoga at 16 years old and has been loving the journey ever since. She now obtains her 500-RYT as well as many other fitness certifications. Because of her fitness background, she provides precise cuing and alignment focus to help you feel confident and comfortable as you flow through class. Her classes have a huge focus on stepping out of your comfort zone and staying present, on and off of your mat. Natalie began her yoga journey after years of competitive figure skating, cheerleading, figure shows and triathlon. Once realizing the amazing physical, mental, & spiritual benefits from practicing she obtained her certification to be able to bring these gifts to others. Natalie is also one of our lead trainers and loves to implement yoga into her clients' fitness routines. Brittney is 200-Hour Yoga Alliance Certified in restorative Hatha and higher-intensity Vinyasa, Yin and introduction to Thai Massage. Her mission is holistic: building a student’s connection between their mind, body, and breath. This connection may begin on the mat, but Brittney strives to have students carry this energy outside of the classroom. With Brittney’s classes, students can look forward to enriching their breath, consciousness, alignment, and flexibility as well as improving their physical and mental strength. Sophia's introduction to yoga began over a decade ago. The combination of balance, strength, flexibility, mindfulness and patience that she experienced in the practice lead to the path of completing the 200 hour Vinyasa Yoga Teacher Training with Jano Galindo at the Chula Vista Yoga Center. Sophia's classes offer a challenging but accessible alignment based flow that promotes harmony between the breath, the body and the mind. Nicole began her yoga journey at 12 years old when finding yoga helped her through unexpected health challenges. Yoga was the saving grace that strengthened and healed her body, mind and spirit. Her personal healing journey inspired her to share her knowledge and wisdom to other yogis. Nicole is deeply passionate about creating opportunities for people of all backgrounds to connect their mind, body and spirit through movement, meditation and personal experience. Her love for yoga and traveling lead her to explore many different styles of yoga, meditation, Ayurveda and dance. Nicole’s classes are in welcoming, safe environments for people to work on defining and building their purpose while improving overall health through yoga, nutrition, and self exploration. Through a variety of poses and conscious sequencing her goal is to help students develop physical strength, flexibility, balance and a connection with their true self. Yoga is one of the many modalities Couron uses to enhance his clients' health and wellness. He is a 200-RYT through Forrest Yoga. Couron's teaching style is an intensely physical and internally focused practice that emphasizes how to carry a transformative experience off the mat and into daily life. The practice challenges students to access their whole being and to use yoga as a path to finding and then cleansing the emotional and mental blocks that dictate and limit their lives. Rachel grew up in Springfield, VA and became a NASM certified personal trainer in 2011. Shortly after, she began teaching small group classes for women on weights and hula hoop fitness and began practicing CrossFit, Pilates, and yoga. Her motivation for beginning this journey came from seeing parents who can’t run around with their kids or people who can’t do simple activities due to pain caused by a sedentary lifestyle and poor eating habits. She became a trainer because she loves helping people and is very passionate about adding positivity and physical activity into everyday life. About five years ago, Rachel began doing aerial arts and fell in love. She relocated to San Diego to be a Circus Artist as part of the San Diego Circus Center with her specialty being Hand balancing and aerial rope. Kris fell into deep love with the healing power of yoga when she was 15. A few years later, Kris began exploring ashtanga yoga and strengthened her asana practice. At 21, Kris decided to embark on a teacher training in New York City, where she leaned heavily on yoga to help her handle the stresses and fast pace of big city life. She completed a pranic flow vinyasa training under the guidance of Lauren Hanna, a student of Shiva Rea. Several years later, Kris has begun to deepen her yoga journey by enrolling in a 300 hour teacher training and taking as many workshops as she possibly can. Kris is trained in vinyasa, yin yoga, reiki and yoga of recovery. Her grandest wish is to help facilitate deep healing and self-love within her students. Things that she is continuously working towards and learning herself. In class with Kris, you’ll find meditative movements, sassy beats, funky flows and some smiles along the way.